Fall leaves and matches don’t mix! The first day of fall arrives this week. It will soon be time for cooler air, drifting leaves, football games, and sweaters! But the smell of burning leaves? No, it is never time for that! Leaf burning releases harmful pollutants into the air. In fact, smoke from just 5 pounds of burning leaves creates a full pound of pollution. Leaf burning can create health hazards for children, the elderly, and people with breathing difficulties, such as asthma. A burning leaf pile can also start a larger fire, putting nearby properties at risk. Be a good neighbor — don’t burn your leaves! • Make a pile and jump into it with your friends. Take some pictures to record your fun! • Save some of the most colorful leaves and press them between sheets of paper (waxed paper and parchment paper from the kitchen work well). Then place them between heavy books or bricks. • Use a mulching mower to shred the leaves and let them stay on the grass. The shredded leaves will provide winter cover to protect grass roots and soil and will decay by spring. 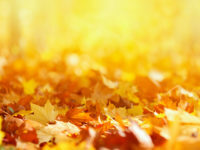 If you have a lot of leaves, mow often during the weeks when the most leaves fall. • Or, use the mower to create leaf mulch. Simply attach the bagger and collect the leaves. Your mower will shred the leaves as it picks them up, creating a great mulch. Put the leaf mulch on your garden or flower beds, around trees, or on paths. Leaf mulch will help keep moisture in the soil where plants will be able to use it next spring. • Pick up shredded leaves with the mower or rake up whole leaves and add them to your compost bin. • After you’ve mulched and composted your leaves, you might have a few bags left over. See if your local solid waste management district collects leaves at the curb or has a place in your community for drop-off. For more on leaf cleanup, check out Grab your rake! and Fall leaves aren’t green, but the cleanup can be!